Es behandelt die Entstehung des Films 'JAILHOUSE ROCK' in vielen S/W- und einigen Farbfotos, in Reproduktionen von Seiten des Drehbuchs und mit Klatsch über das Geschehen bei den Dreharbeiten anhand von Interviews. In jeder Beziehung aussergewöhnlich und gut. Jedem auch noch so gebeutelten Elvis-Fan zu empfehlen. Several years ago my Memphis sidekick, Delbert Rhodes, and I picked up a treasure of material from the 'Jailhouse Rock' movie, from a couple of inside sources from that era in Elvis's life, one living in Nashville and the other in San Diego. That sparked the idea of producing a book on the classic 1957 movie and laid the groundwork for this project. 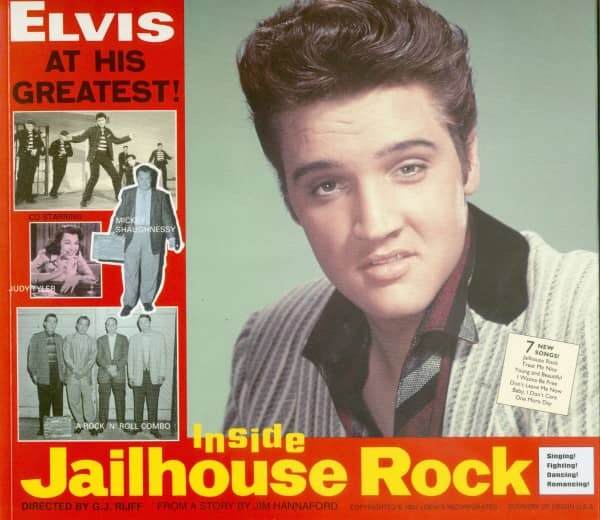 Today, 'Jailhouse Rock' is as popular as ever; and, having been colourised by Ted Turner's world-famous company, is now avail-able on both video and laser disc, still looking and sounding like one of the greatest rock movies of all time. The year 1992 marked its 35th anniversary. It was also the year BMG fittingly chose to release its boxed set, 'Elvis The King of Rock and Roll The Definitive '50s Masters'. In preparing this book I decided that in-depth interviews with the principals was out of the question for a number of reasons: so many of them - the cast or the people at MGM - are no longer alive, and those who are probably have clouded memories of the film. Also I worried that some of the stories given to me by the so-called 'Memphis Mafia' were probably tainted by the ageing pro-cess and had been added to as the years went on. One individual actually wanted a piece of the action of the book, and as I knew this wasn't going to be a best seller, I squashed that idea. Sadly some of the people from the former Presley circle seem to think they are stars in their own right now! One day, however, I received a letter from Dutch fan, author, designer, and superb artist, Ger Rijff, who had read my stories about 'Jailhouse Rock' in 'Discoveries' magazine and offered his help on the book project. The result of this is a collaboration of Ger Rijff's stunning artwork and the textual material - photo-graphs and other memorabilia from the Jim Hannaford/Delbert Rhodes collection. We would also wish to thank Howard Banney in New York, Glen Johnson in Canada, Marie Fletcher in Oklahoma City, as well as our insider at MGM and contact in Madison-Nashville. In the following pages we have included literally hundreds of unseen stills footage, many of them showing different camera angles from those normally seen, as well as shots from parts of the movie which were deleted, all the work of stills photographer, Ken Bell; press book material, publicity material, and actual MGM docu-ments and letters. Of tremendous interest to collectors are some of the pages of dialogue, with notations made in pencil by Grace Dubray. Using Marie Fletcher's press clippings from the period, we have attempted an overview of some of the stories/rumours circu-lating during the filming, taking a look at the recording session for the film, and generally discussed what was going on at the time. A time when all was, indeed, cool, and Young Elvis ruled Hollywood! 110 pages/Seiten, 23x25 cm, Paperback: Among the flood of over and over recycled Elvis Presley material, this book really stands out as brilliantly edited, informative and full of unpublished pictures. 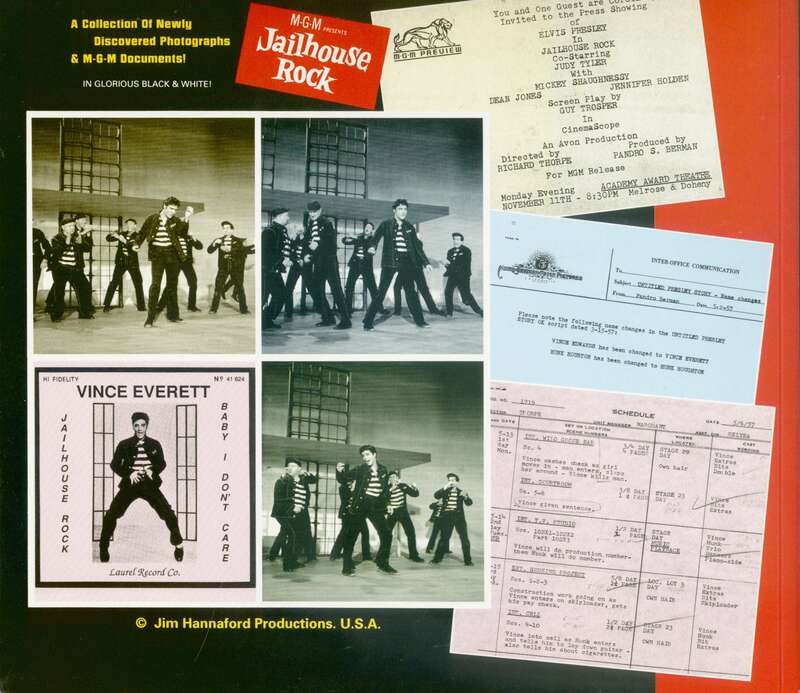 It roughly shows the story the making of the movie 'JAILHOUSE ROCK' with excerpts from the script on-scene and off-scene b&w photographs and some rare information on what happened on the set. This, dear and exploited Elvis fan, is really worth your money. In der Flut von Fotobänden über das Leben von Elvis steht dieses Buch wie ein Fels in der Brandung: Es behandelt die Entstehung des Films 'JAILHOUSE ROCK' in vielen S/W- und einigen Farbfotos, in Reproduktionen von Seiten des Drehbuchs und mit Klatsch über das Geschehen bei den Dreharbeiten anhand von Interviews. In jeder Beziehung aussergewöhnlich und gut. Jedem auch noch so gebeutelten Elvis-Fan zu empfehlen. Évaluations de clients pour "Inside Jailhouse Rock"